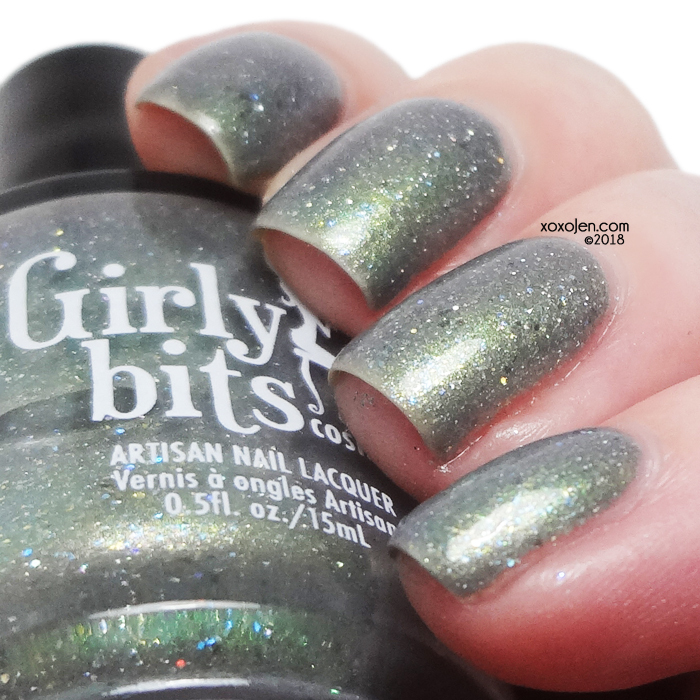 Girly Bits offers us a monthly selection of limited edition polishes which are available for purchase from the 1st until the end of the month. January's polishes are amazingly beautiful, let's have a look! Blue Year’s Resolution is a blurple holo base with teal-purple-blue colour shifting shimmer, and tiny green/blue glitter. Since the polish is so awesomely shifty, it was tough to photograph! I had good success capturing some of the shifting effect with a softer light, however it is quite visible in person under just about any light. Two coats. And her purple side!! She's a shifty wench! Act Your Sage is a murky greyish green base with a slight blue shine, iridescent blue flecks, tiny holographic glitters, and tiny gold flecks. The base color adds a smoked effect and you can see a purplish hue around the nail curve in the macro shot. This polish is so enchanting. It's shimmery in the sun, and reminds me a little of succulents! If you are a green nail polish fan, this is totally a winner. Three coats. Both polishes have excellent formulas and applied brilliantly. Pam has done a fantastic job creating these and I'm absolutely smitten by them. You can get these in an early Bird Special if you pick up the duo from the Duo Early Bird Promo listing between Jan. 1 and 10! And remember that if you're in the U.S., there's a group order on facebook where you can save on shipping too!